His life in brief: Born in a village near Galilee, he lived in exile for most of his life and started writing poetry after high school. He was arrested several times by Israel for what were deemed to be inciteful poems. Most of his work focused on the love and yearning for his homeland, and he was regarded the Palestinian poet of resistance. Over the course of his life, he published more than 30 poetry collections and books of prose, with his work translated into more than 20 languages. Many of his poems were set to music by Arab composers, most significantly Marcel Khalife. Darwish died on August 9, 2008 after undergoing heart surgery in the United States. He was later buried in Ramallah where a shrine was erected in his honour. 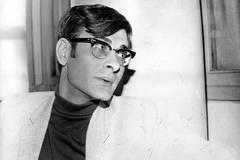 There will be scores of articles published today celebrating the life and work of Mahmoud Darwish, who died 10 years ago in Houston, Texas, following complications that resulted from open-heart surgery. Darwish is hailed as Palestine’s national poet, a writer who did more than any other to create a Palestinian national consciousness through his work. Both the influence and admiration of his work have only grown since his death, in large part due to translations of his poetry into English and other languages, and the myriad ways he has inspired other artists in their creative work. A very bleak decade for Palestinians has passed since his death – three deadly and destructive military assaults by Israel on the captive population in Gaza; a decade of de-development in Gaza, exercised by Israel and Egypt through the continuing blockade, precipitating an imminent humanitarian crisis; the ongoing colonisation of Palestine; Trump’s official recognition of Jerusalem as the capital of Israel; more than 150 Gazans killed and 16,000 injured by Israeli snipers in recent months during the Great March of Return; the nation state law passed last month by the legislature of Israel – not to mention Palestinian factional divisions and much more. His letter to PalFest before he died is a sobering but inspiring and urgent message to fellow international writers. The importance, honesty and power of these words resonate today more strongly than ever. “Your courageous visit of solidarity is more than just a passing greeting to a people deprived of freedom and of a normal life; it is an expression of what Palestine has come to mean to the living human conscience that you represent. It is an expression of the writer’s awareness of his role: a role directly engaged with issues of justice and freedom. The search for truth, which is one of a writer’s duties, takes on – in this land – the form of a confrontation with the lies and the usurpation that besiege Palestine’s contemporary history; with the attempts to erase our people from the memory of history and from the map of this place. Palestine continues to be an issue that many international artists shy away from because they feel they don’t know the facts and are afraid to be accused of anti-Semitism. Anyone following the implosion of the Labour Party in the United Kingdom over anti-Semitism claims will understand the effectiveness of this tactic to silence critics of Israel. As Israel entrenches its colonisation and cracks down on human rights activists and civil liberties, Soueif says that she sees hope in the growing boycott, divestment and sanctions (BDS) movement set up for Palestinian civil society. Ten years on, Darwish’s legacy is out of his hands – and in the hands of those who have inherited his words. < Warum die plötzliche Aufregung über Rassismus?